The queen forced her eyes shut as another wave of pain shook her. Almost without warning, she called out, "Gorsefeather!" 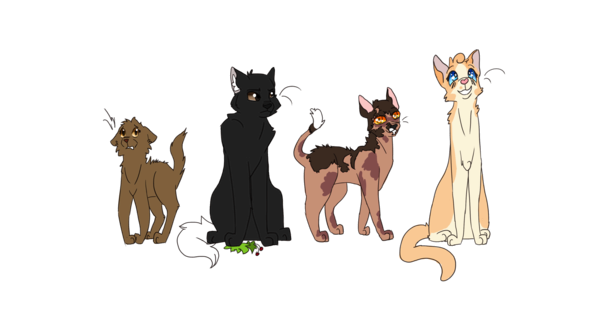 She prayed to Starclan that he would be able to help, that these kits were not dead as she so undoubtedly believed. The two brothers sat by the fresh kill pile, enjoying the calm day when they heard their mothers cry. Icestorm and Cedarfur looked at eachother with worried glances. Gorsefeather, who'd been tending to his herb stores, shot up alert at the sound of some cat calling for him. The calico dropped whatever he'd been doing and bolted out of the medicine cat den, stirring up dust in his wake as his paws scrabbled for him to follow the plea for assistance. He already had a couple of scenarios in mind, and he truly hoped it was the usual. He'd been a medicine cat for many moons, but there were limits to what the tom could heal with his skills. "Pebblelight? Do you feel it's time?" The medicine cat asked when he realised it was the queen who had called him over. He knew she'd been in pain for the past few days, it didn't take an expert to know. But he'd thought it was just pre-labor pains. The length had been odd, but he hardly had any other experiences to compare this too, so had assumed it was just an unusual pregnancy. He gently hovered a paw over her belly, giving her a second to move away if she wished before placing it down on her belly to feel. The contractions seemed normal, coming rhythmically. Though the kits did seem to not squirm as much. But each birth was different. Nothing he'd be particularly concerned over. "Icestorm, there should be a bundle of pink and white flowers and their leaves in my den. Cedarfur, cobwebs should be on a stick near the bitter smelling herbs. I need the both of you to hurry and fetch these things. Go!" Her eyes became slits when a wall of strange pain seemed to well up from inside. It was as if she couldn't control her own muscles, it should have been instinct, but this was far different. A single ripple shook her and... something landed in the nest. It was barely recognizable as a she-kit; she might have been white at some point. However, she was long dead. Pebblelight had a single moment for her face to contort into complete terror before she curled in on herself out of agony. Icestorm and Cedarfur ran to get the supplies needed, and came back to Gorsefeather as fast as they could. Looking at their mother, the brothers could tell something was wrong. "Gorsefeather, something's not right here..." Icestorm said nervously. Gorsefeather knew on sight that the kit had been long dead, it's limp body practically solid as death had settled in. It was a horrific to look at, but a medicine cat was never in a position to hesitate. He torn open the packages the two toms had brought, shoving out of the way when necessary to get at the herbs. Burnett, Chervil, they were the usual herbs needed to help with a kitting, but this wasn't enough and he knew it. "Juniper berries, and poppy flowers. You need to fetch them now. Juniper looks purple-blue and poppy flowers are red. Go!" The other herbs, the calico quickly pushed them to the queen. Licking her soothingly on the head as she curled up in agony. There was little he could do for her, only ease her pain and stop any unusual bleeding. This was new to the tom as well. "I need you to eat these leaves, Pebblelight. There's nothing that can be done for your kit, but you can still live." Icestorm sat with his head hung over his shoulders. He wasn't a medicine cat, but he defiantly had a sense for death, and could tell his mother was leaving this world. Cedarfur looked over at his brother with a shocked look on his face. "Mousebrain! Do what Gorsefeather said!" he hissed, running out to get juniper berries and poppy flowers. Icestorm sat in silence, holding back a few tears. Her eyes were wide open now, unblinking. Stars almost literally danced before her eyes. Starclan was coming to take her away, weren't they? Would this nameless kit be up there waiting for her? No. She had to live, to take care of her sons even if this next kitten couldn't make it. Pebblelight struggled to open her mouth to take the herbs. She was only able to lick up a single leaf of chervill before another kit wanted to be free. It was weak, but alive. Within a few pushes all strength left her, the weak kit shivering in the nest next to their sister. With that, Pebblelight's faint green eyes were dull and her breaths were weak and shallow. Unable to shift her head, the queen whispered on her last breath. "My boys. I'll be watching over you now." She was gone. Watching Pebblecloud leave them for StarClan was gutting in a way the medicine cat had never truly experienced before. He'd lost cats before, to wounds too deep, to the Thunderpath monster's maw, and to illness. But she was the first he'd ever lost to a kitting. Her limp body laid beneath his paws alongside a stillborn, and a kit barely clinging to whatever life remained in it. When he lowered his head to lick the kit to stimulate her, it was all instinct but his head was numb. Pebblecloud had died under his watch, and all he could think was how he should have done more. If only he'd taken her labor pains more seriously. If only he'd treated her sooner. "Icestorm. Cedarfur. I'm... I'm sorry. She's gone." Icestorm broke his silence and gave a hiss towards the medicine cat. "Ya, I can tell!" Was all the tom said and stalked off. Cedarfur stared at his mother, dropping the poppy flowers at his feet. "P...Pebblelight? Come on, wake up," the tom sputtered, taking a step toward his limp body. In all honesty, he didn't know who to be angry at. 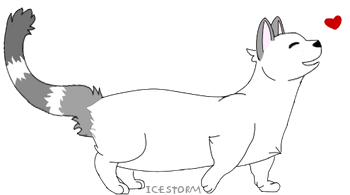 StarClan, Gorsefeather, or Icestorm. But most of that anger was filled will sadness at the moment.